Our specialized curriculum, Stepping Stones to English, provides sound, direct instruction of the Shurley method in Spanish first and then with an Integrated Language Phase. Instruction begins in Spanish so that students fully comprehend the Shurley method. Then, English is gradually introduced to help students gain confidence for the transition phase of the program. ELLs will gain confidence with both their first language and English in a systematic, logical approach. When students have completed all the learning and transition phases, they will have acquired the essential English skills they need for success in the regular classroom. 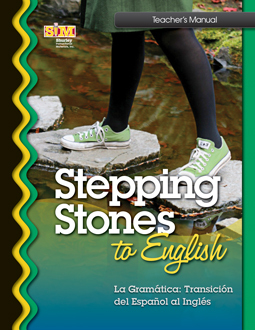 Provides a Gradual Release of Responsibility, which allows students to achieve both competence and independence as they make the cognitive leap from Spanish instruction to English instruction. Utilizes Spiraled Instruction as a key feature to allow for consistent reinforcement of key grammatical skills. Paves a pathway to English Literacy and equips ELLs to thrive in any academic setting. utilizes proven methods of learning and teaching. clarifies learning goals and expectations for students. presents concepts logically and systematically. employs a unique Q&A Flow process to analyze parts of speech. supplies a systematic review of concepts. This comprehensive manual includes everything the teacher needs to plan, manage, and implement the program. It includes instructional strategies and scripted lessons so that the teacher can easily facilitate students' transition into English. Students' English literacy gets a jumpstart in this program so that they can be integrated seamlessly into any classroom setting. Includes the Jingle Time audio CD. In order to complete the course, each student will need a consumable workbook. Each workbook contains definitions, practices, and checkups. Student Workbooks are not copy masters and may not be duplicated.